Work has commenced in Plymouth on the new traffic free walking and cycling route on land supplied by Railway Paths and Sustrans between Laira Rail Bridge and the new Saltram Meadow housing estate. The new link, funded through the Heart of the South West Local Enterprise Partnerships’ Local Transport Board and Section 106 contributions, is expected to be opened to the public in Spring 2017. 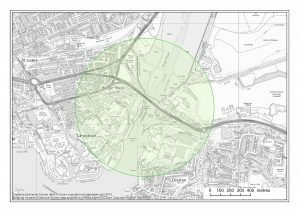 The route will provide a traffic free connection between Laira Bridge Road and Billacombe Road. There are future plans to extend the route further along the ex railway line to create a longer and direct link in to Broxton Drive.